What is Carton Gravity Flow System? 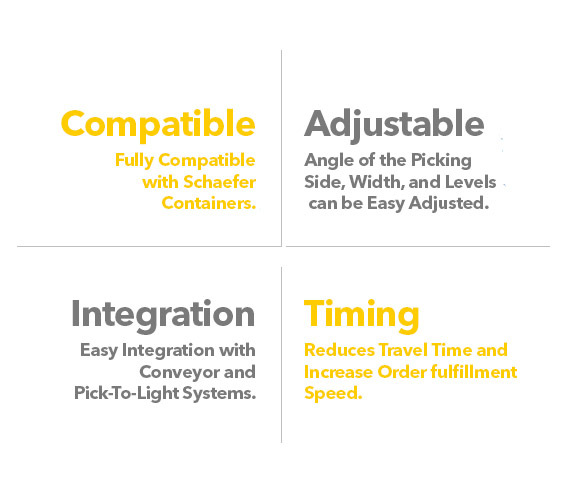 Reducing costs by optimizing work processes is the key to successful supply chain operations. 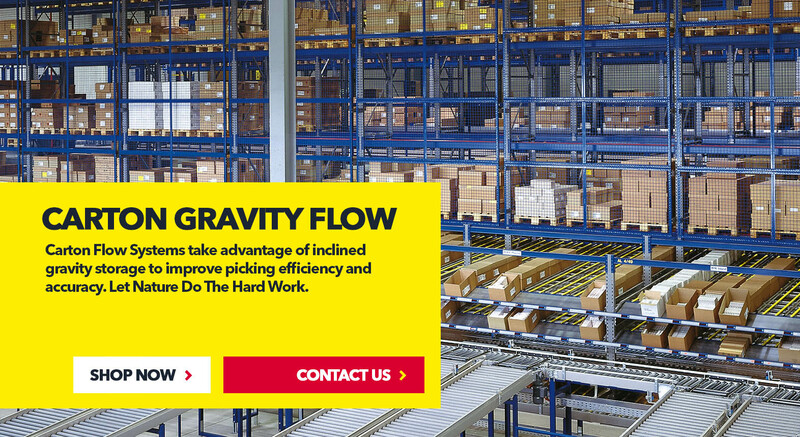 Gravity flow systems guarantee a continuous supply of small parts at the assembling place, production or picking line. Secure and stable upright frame combined with reinforcing cross beams form a "racking frame" to house entire flow bed units. The flow beds can be modified quickly and without screws using adjustable hooks at a module pitch of 6.25mm (upright types P63/P65) or 12.5mm (upright types P73/P93) in height and inclination and in the horizontal position at a pitch of 25mm. Every ergonomic requirement can be met by designing the flow bed in a stepped shape, with discharge plates or an angled design. Transverse-motion conveyors can be connected in a cost-effective way thanks to supports positioned on the uprights. Robust roller tracks in different designs guarantee the friction-free movement of containers from the replenishment to the picking side. 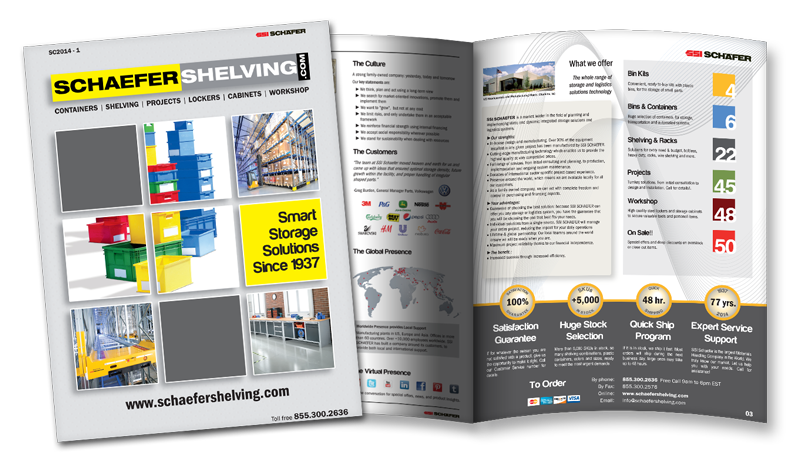 By using different dividing rail systems, guides (channels) can be created to precisely match the containers..
On-line shelving can accommodate any size and type of container securely and is therefore extremely versatile. The high load capacity of max. 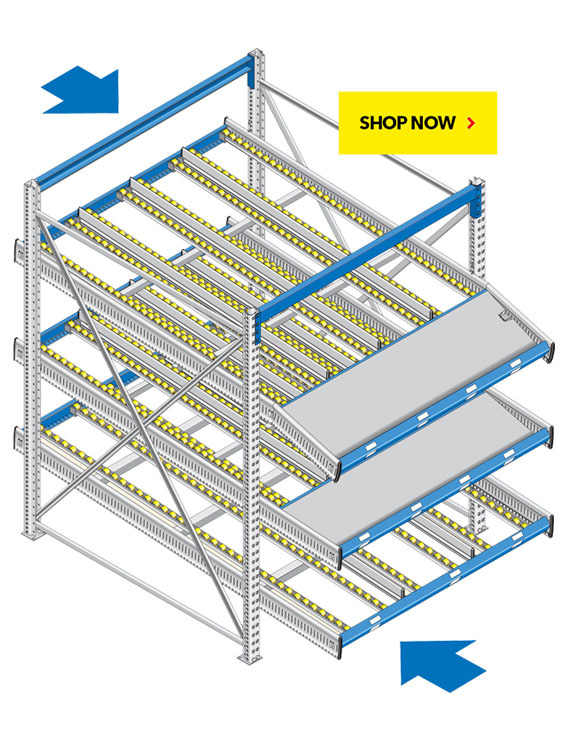 2,5 t per bay, their flexibility via the combination of starter bay and extension bays to form rows of shelves, the variability of the shelf depths thanks to the design as single depth and double-depth shelves, as well as the cost-effective design with all-galvanized components option are the key features of these on-line shelving systems from SSI SCHAEFER. Plug-in box guides in a pitch of 1.6" made from wire clips can be used to divide the compartments. 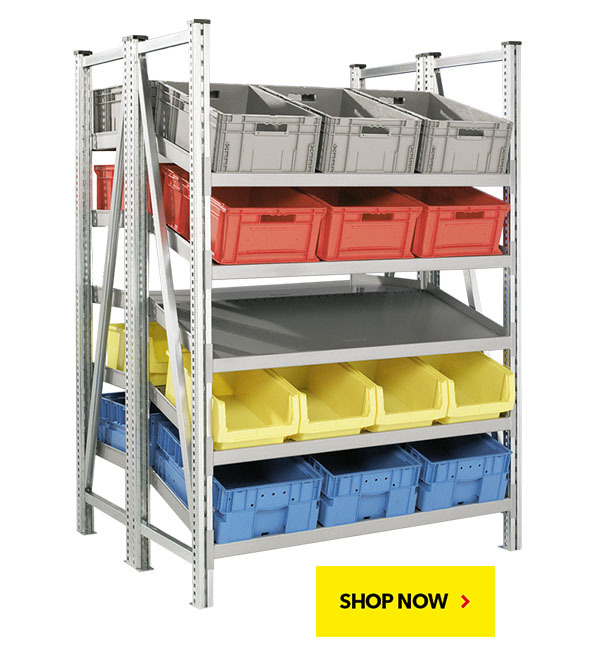 Pre-assembled frames and system parts are joined bolt-free, which makes the system quick and easy to assemble. End stop bars or end stop beams secure the stored goods on the tilted levels. The side rails on the front of the shelves prevent items from falling between the shelving uprights. 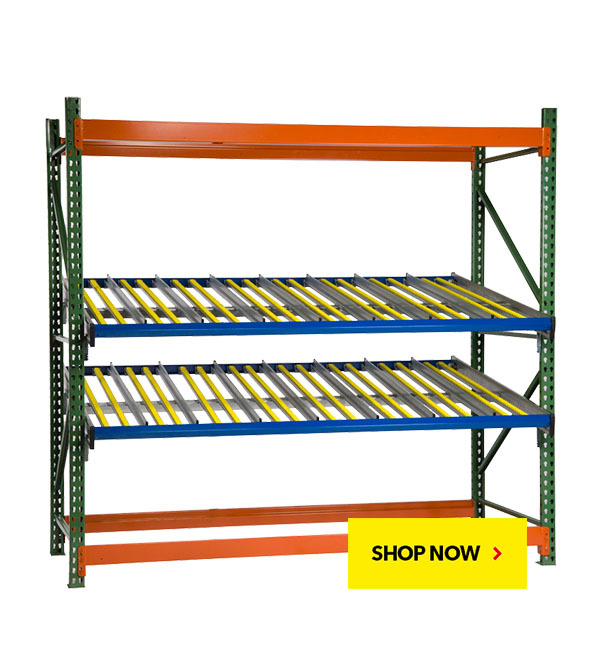 You can retrofit an existing selective pallet rack installation to add Gravity Flow Picking Levels and reduce your order fulfillment time and costs. 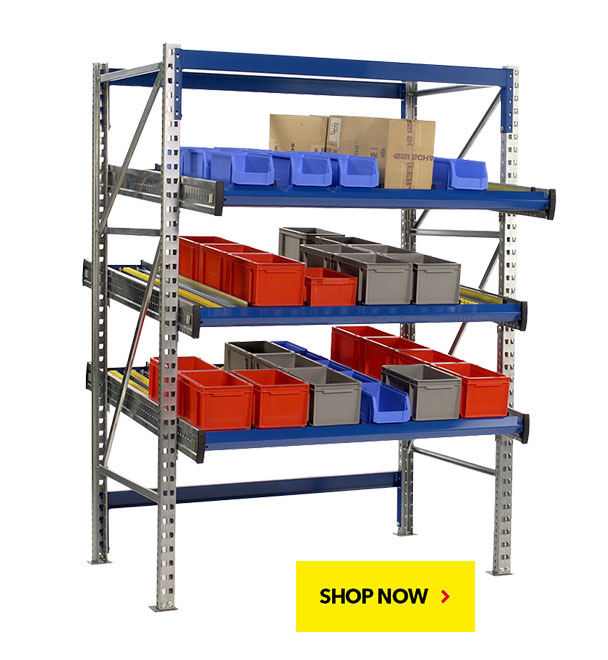 Schaefer's universal adaptor clips fit most tear Drop Pallet Rack Systems on the market. Simply request a Free-Verification Kit to ensure a seamless installation. Levels are simple to install. Roller and Guides position can be adjusted in less than 1" increments to fit the exact dimensions of your boxes, cartonsor totes.